So, ever since KCON2014 I’ve REALLY been into makeup. I used to just wear it because, you know, why not? But now I’m way more experimental with colors and palettes, and some of my friends have subscribed to beauty boxes, such as ipsy or Birchbox. Well, I love Korean products, so why not try a Korean beauty box? There are several suppliers, and I’ve tried two, the first is MEMEBOX. They are pretty pricey, first off. Boxes start off somewhere around $22, and can go upwards towards $45-$50 depending on the collaboration. MEMEBOX has mystery boxes, themed boxes and collaboration boxes with makeup artists and beauty YouTubers. 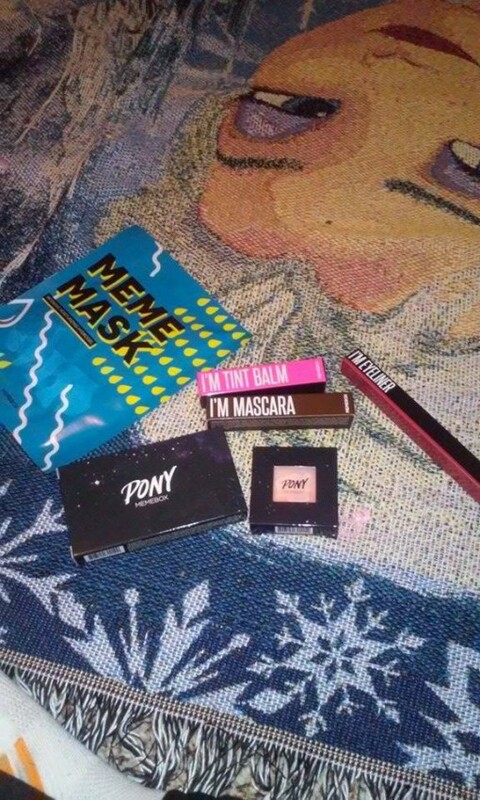 I ordered the PONY box, which came with two pony products (eye shadow palette and blush box)and the rest were MEME brand makeup, such as I’m Eyeliner, I’m Mascara, and I’m Tint Balm. So let’s get to reviewing individual products, shall we? I love the Tony Moly hydraulic acid masks, because they are SOOO hydrating, so when I saw this, I was totally pumped. And the mask comes in two pieces, one top and bottom for your face. Once I opened it however, I was greeted by a funky smell. Not only that, but when I tried to pull it out, at first I thought it was made of plastic, like I’d been jipped (ripped off). However, it’s a gel mask, and it’s extremely slippery. I actually ended up ripping the top half a bit, and it took me literally five minutes to unstick it from itself and put it on. I had to smooth the mask over my arm first and THEN to my face, which was still difficult. 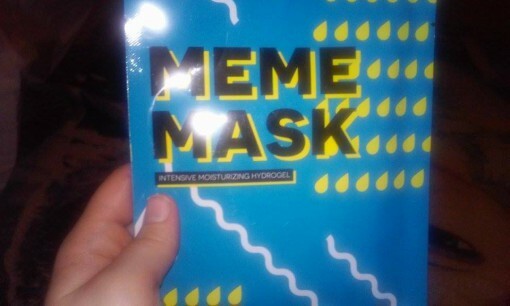 It didn’t adhere very well like sheet masks and rather than hydration, all I was met with was stickiness. -1 out of 5 for you. 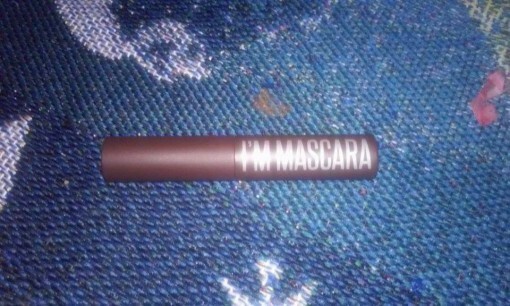 Next up is the I’m Eyeliner in Blazing, which is redish, almost a dark pink. 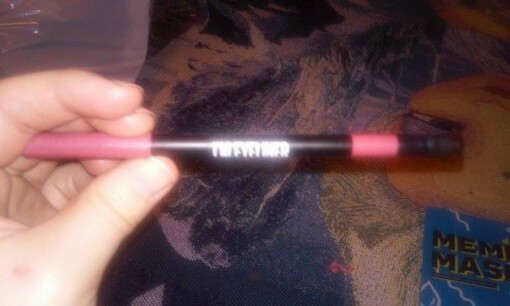 It goes on smooth, and the color is quite vivid, and the opposite end contains a smudge brush. 5 out of 5 for you. After this I tried the I’m Mascara, and it goes on okay. Since my hair is brown, it blends in and doesn’t give me that ‘oomph’ that I’m looking for, but it would be good for a more natural look. 4 out of 5 stars for you. 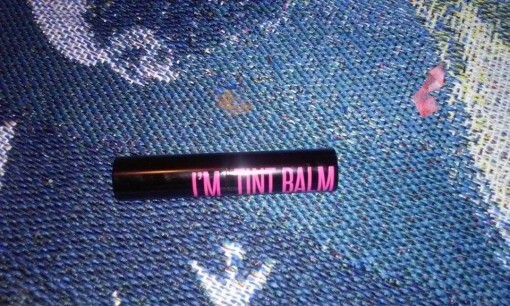 The Tint Balm came in Neon Pink, and is SUPER hydrating. Now while the tint is BLAZING pink, it adds a lovely pop of color. 5 out of 5 stars for you, and my favorite product of the bunch! Next comes the Pony Easy Mix Block blush in Galaxy Pink. To be quite honest I don’t use blush, because naturally my cheeks are quite pink enough. The bottom two pigments pop more than the top, but I guess it’s all in the look you’re trying to achieve. 3 out of 5 stars for you. 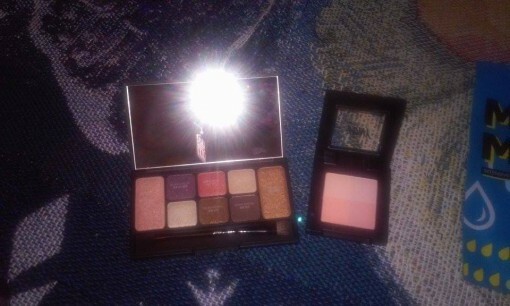 Next, is the last product in the box and that would be the PONY SHINE EASY GLAM 2 eye shadow palette. The colors come out quite easily, and I’m happy to say that I love the color choices, which means this can be used daily. Overall, the box is a success. They are sold out of this box, but feel free to browse the other boxes and buy these MEME brand makeup products individually on their site!